Answering inference based questions is a bit tough when compared to other types of questions that have been asked in reading comprehension section. But by carefully studying the passage and by drawing right conclusions in the light of the passage make us answer this type of questions correctly. It is advisable to go to the reasoning articles and read "evaluating inferences" before you start reading this lesson. Let us understand what is an inference. Inference is a conclusion drawn in the light of the facts presented in the passage. Then you may ask how it differs from the Conclusion? Please understand, only in argumentative passages or paragraphs we usually find conclusions as author tries to convince others to prove his point. All the reasons that author states in the passage act as premises and any unstated reasons act as assumptions. But, most of the times an author discusses various points and may leave the conclusion to the reader. So inference is a conclusion drawn by the reader in the light of the facts presented in the passage for his understanding and author may agree with that also. But it is not the intention of the author. In an annual general meeting the Chairman of the board said "This year we expanded our capacity of our plant to 1000 metric tonnes from 500 metric tonnes so next year profits will be double to this year's profits"
We can infer from above that profits will grow along with the subsequent sales of the expanded capacity. Nearly a century ago, biologists found that if they separated an invertebrate animal embryo into two parts at an early stage of its life, it would survive and develop as two normal embryos. This led them to believe that the cells in the early embryo are undetermined in the sense that each cell has the potential to develop in a variety of different ways. Later biologists found that the situation was not so simple. It matters in which plane the embryo is cut. If it is cut in a plane different from the one used by the early investigators, it will not form two whole embryos. A debate arose over what exactly was happening. Which embryo cells are determined, just when do they become irreversibly committed to their fates, and what are the “morphogenetic determinants” that tell a cell what to become? But the debate could not be resolved because no one was able to ask the crucial questions in a form in which they could be pursued productively. Recent discoveries in molecular biology, however, have opened up prospects for a resolution of the debate. Now investigators think they know at least some of the molecules that act as morphogenetic determinants in early development. They have been able to show that, in a sense, cell determination begins even before an egg is fertilized. Studying sea urchins, biologist Paul Gross found that an unfertilized egg contains substances that function as morphogenetic determinants. They are located in the cytoplasm of the egg cell; i.e., in that part of the cell’s protoplasm that lies outside of the nucleus. In the unfertilized egg, the substances are inactive and are not distributed homogeneously. When the egg is fertilized, the substances become active and, presumably, govern the behavior of the genes they interact with. Since the substances are unevenly distributed in the egg, when the fertilized egg divides, the resulting cells are different from the start and so can be qualitatively different in their own gene activity. The substances that Gross studied are maternal messenger RNA’s --products of certain of the maternal genes. He and other biologists studying a wide variety of organisms have found that these particular RNA’s direct, in large part, the synthesis of histones, a class of proteins that bind to DNA. Once synthesized, the histones move into the cell nucleus, where section of DNA wrap around them to form a structure that resembles beads, or knots, on a string. The beads are DNA segments wrapped around the histones; the string is the intervening DNA. And it is the structure of these beaded DNA strings that guides the fate of the cells in which they are located. In the first paragraph, Author mentions about "substances" which acts as morphogenetic determinants and in the second paragraph, he named them an maternal messenger RNA's. Now look at the options: (A) is not correct as the substances Gross studied are lying out side of the nucleus. (B) is not correct as these substances are unevenly distributed in the egg. (C) is a trap. Please understand These substances are inactive until the egg fertilization not until the cell determination. Once the egg is fertilized, these substances become active and govern the fate of the cells. But If these substances are inactive till the cell determination, which one will decide the fate of the cell? (D) is a very close option. From the passage we understand that the substances are active after fertilization, but whether these substances are identical to the previous ones or may not take any shape or change in composition, nothing will be discussed in the passage. It is just an assertion with no facts presented in the passage. Now we left with only one option. How do we know that there are enough morphogenetic determinants present in the early embryo? An embryo is the very initial stage of the child or animal just after the fertilization of egg. It is just a collection of cells. Now the morphogenetic determinants will decide which cell becomes leg, or hand or any other limb. Look at the first paragraph. Nearly a century ago, biologists found that if they separated an invertebrate animal embryo into two parts at an early stage of its life, it would survive and develop as two normal embryos. If scientists divide the embryo into two parts it survives and developing into two normal embryos. If there is enough morphogenetic determinant available to determine only one embryo, then both embryos may not develop into normal embroyos. So it is believed that there is enough morphogenetic determinant available to determine two embryos. This makes our answer choice E correct. We know that the substances author discussed are RNA's and these RNA's Direct the Synthesis of histones and these histones after synthesis move into the cell nucleus. So we can infer that these histones may be outside of the nucleus before they move into nucleus. In the first paragraph author named the outside the nucleus as Cytoplasm, so we can infer that these histones might be produced in the cytoplasm. Option A is correct. 3. It can be inferred from the passage that which of the following is dependent on the fertilization of an egg? substances that function as morphogenetic determinants. They are located in the cytoplasm of the egg cell; i.e., in that part of the cell’s protoplasm that lies outside of the nucleus. In the unfertilized egg, the substances are inactive and are not distributed homogeneously. When the egg is fertilized, the substances become active and, presumably, govern the behavior of the genes they interact with. Since the substances are unevenly distributed in the egg, when the fertilized egg divides, the resulting cells are different from the start and so can be qualitatively different in their own gene activity. When the egg is fertilized the RNA's become active and direct the systhesis of histones. 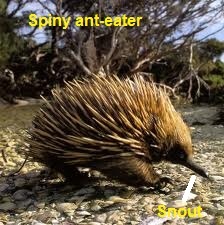 Option C.
Australian researchers have discovered electroreceptors (sensory organs designed to respond to electrical fields) clustered at the tip of the spiny anteater’s snout. The researchers made this discovery by exposing small areas of the snout to extremely weak electrical fields and recording the transmission of resulting nervous activity to the brain. While it is true that tactile receptors, another kind of sensory organ on the anteater’s snout, can also respond to electrical stimuli, such receptors do so only in response to electrical field strengths about 1,000 times greater than those known to excite electroreceptors. Having discovered the electroreceptors, researchers are now investigating how anteaters utilize such a sophisticated sensory system. In one behavioral experiment, researchers successfully trained an anteater to distinguish between two troughs of water, one with a weak electrical field and the other with none. Such evidence is consistent with researchers’ hypothesis that anteaters use electroreceptors to detect electrical signals given off by prey; however, researchers as yet have been unable to detect electrical signals emanating from termite mounds, where the favorite food of anteaters live. Still, researchers have observed anteaters breaking into a nest of ants at an oblique angle and quickly locating nesting chambers. This ability quickly to locate unseen prey suggests, according to the researchers, that the anteaters were using their electroreceptors to locate the nesting chambers. 1. Which of the following can be inferred about the experiment described in the first paragraph? (A) Researchers had difficulty verifying the existence of electroreceptors in the anteater because electroreceptors respond to such a narrow range of electrical field strengths. (B) Researchers found that the level of nervous activity in the anteater’s brain increased dramatically as the strength of the electrical stimulus was increased. (C) Researchers found that some areas of the anteater’s snout were not sensitive to a weak electrical stimulus. (D) Researchers found that the anteater’s tactile receptors were more easily excited by a strong electrical stimulus than were the electro receptors..
(E) Researchers tested small areas of the anteater’s snout in order to ensure that only electroreceptors were responding to the stimulus. Option A is wrong as the electroreceptors responded to very weak electrical fields and the scientists observed the nervous activity. Option B is wrong as Nothing has been said about the nervous activity with the increment of electrical field. Option C is also wrong as nothing confirms about the inactive spots on the snout of the ant eater. Option D is against to the passage as it states clearly that to respond tactile receptors require 1000 times more stimuli (in red letters). Now Option E confirms to the experiment as the scientists exposed small areas of the snout to ensure that it is only because of elector receptors the brain activity got increased not by any other organ. 2. Which of the following can be inferred about anteaters from the behavioral experiment mentioned in the second paragraph? (A) They are unable to distinguish between stimuli detected by their electroreceptors and stimuli detected by their tactile receptors. (B) They are unable to distinguish between the electrical signals emanating from termite mounds and those emanating from ant nests. (C) They can be trained to recognize consistently the presence of a particular stimulus. (D) They react more readily to strong than to weak stimuli. (E) They are more efficient at detecting stimuli in a controlled environment than in a natural environment. Option A is wrong as this experiment is not about distinguishing electroreceptors and tactile receptors. Option B also wrong as not information has been provided about their efficiency to distinguish ant nets and termite mounds. Option C is correct as anteaters can be trianed and the evidence is consistent with their hypothesis. Option D is also wrong as in this experiment they have not altered the stimuli. Option 5 is wrong as even though scientists failed to notice any sort of stimuli from termite mounds to attract anteater to them, but this does not contradict their hypothesis that they can identify their prey by the stimuli given by the prey.